A service celebrating the life of Mr. William Calvin Newman-Trott, beloved husband of Mrs. Lois Trott, father of Dwayne Trott [Eleanor] and Delia Basden, and grandfather of Tariq and Terrell Basden and Nathan Trott of #10 Smith Hill Drive, St. David’s DD 02, will be held on Saturday, September 15th 2018, St. Peter’s Anglican Church, St. Georges at 2:30 p.m. Interment will follow in St. Peter’s cemetery. Visitation: Relatives and friends may pay their respects today, Saturday 15th at the Claire Spencer Hall [St. Peter’s School Room from 1:30 pm to 2:20 pm. 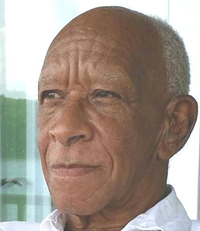 He is son of the late Clarence Newman-Trott and the late Gladys Newman-Trott nee Burgess; brother of Wilbert Trott and the late Aldean Trott; uncle of Nicole Trott. Also survived by other dear relatives and numerous friends. In lieu of flowers donations can be made to the Bermuda Sea Cadets Corps.